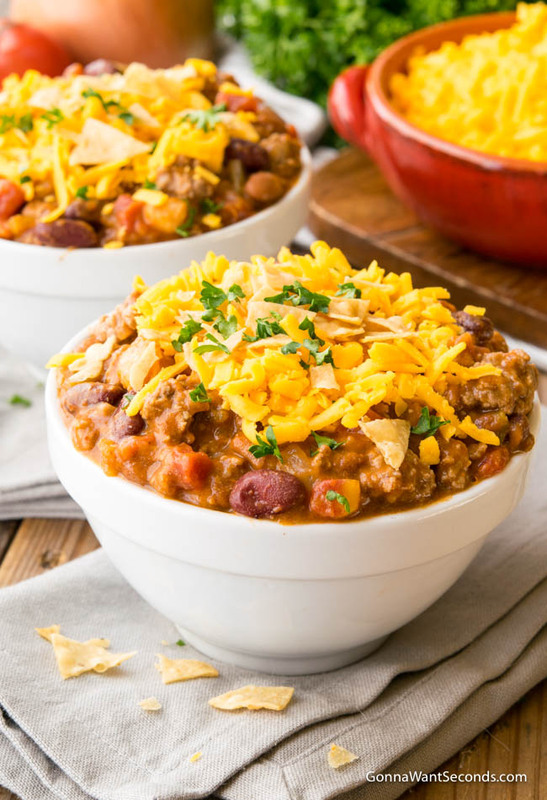 Taco Chili – it’s the chili that the whole family will love! This warm and chunky chili, seasoned like your favorite taco filling, is a one-pot wonder and guaranteed dinner favorite. Pin it to your CHILI BOARD to save for later! Imagine taco night with just one dirty pot! Spicy ground beef, chilies, beans, and tomatoes, with all the classic Tex-Mex flavors – Taco Chili’s a game-changer for busy weeknights (with killer leftovers, too), and you won’t miss those taco shells! Yes, it’s basically a taco served in a bowl, and some even call it “taco chili soup,” but it’s definitely a thick, chunky dish, not something thinner and brothy-er like a chicken tortilla soup. You can pull this hearty, home-cooked meal together in about the time it takes to raid your pantry, and no one will ever know you didn’t camp out in the kitchen all day. HOW DO YOU MAKE TACO CHILI? Making Taco Chili couldn’t be simpler. It’s one of those “dump” recipes that combines a little-browned ground beef and onions with beans, taco seasoning, green chilies, tomatoes, and corn – all store-bought, time-saving items. It just needs an hour for the flavors to come together and dinner is served! 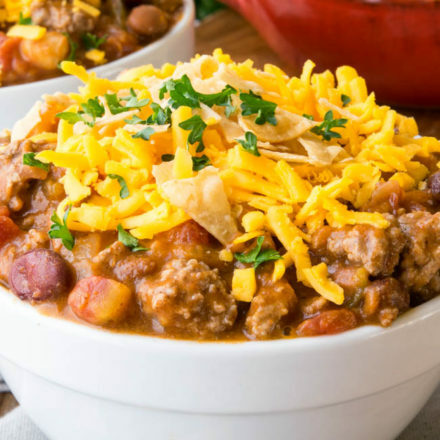 I have a few ingredients in my Taco Chili recipe that sets it apart from others, though, and I think you’ll find they really add something special to this exceptionally simple dish. This quick Taco Chili recipe starts with ground beef and chopped onions, sautéed in the fat from the beef so the onions get really flavor-packed right away. 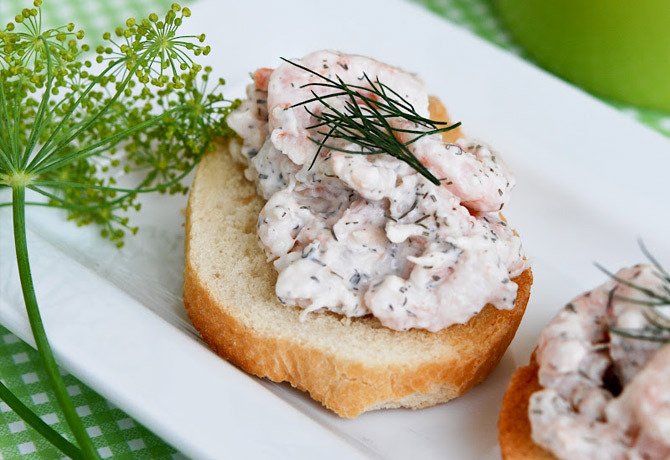 The only other prep work you’ll need to do for this recipe is pulled out your can opener! We’ll add diced green chilies (either mild or spicy depending on how hot you like it) and two different kinds of beans: kidney and chili beans. Chili beans are a wonderful invention, different varieties of canned beans (pinto, kidney, even black beans) pre-seasoned with chili powder, cumin, and other “chili” spices. Depending on the brand, they can also span the heat spectrum from mild to spicy, so feel free to pick and choose whatever you like. The other traditional veggie in Taco Chili is corn, and regular readers know how much I love the combination of sweet yellow kernels with Mexican-style dishes like my Mexican Spaghetti. Rather than sticking with kernels in this dish, though, I use hominy to impart the same corn flavor with a more interesting, meatier texture. If you’re not familiar with hominy, which is used in the classic Mexican-style soup pozole, it’s about the size of a chickpea and has a slightly softer, almost chewy quality. To make hominy, they soak dried kernels of white or yellow corn in an acidic solution (usually made with lime juice). That process breaks down the corn and makes it stick together when it’s ground, which is how they make masa and those crispy taco shells you’d be having on a traditional taco night. Before its ground, the corn is plump and fluffy, and that’s what we’ll be using in this chili. You’ll usually find it in either the canned vegetable section at the grocery store or in the Latin section (with chipotle peppers and other Mexican ingredients). For the tomatoes, we have two choices: use Rotel tomatoes (like a lot of the taco chili Allrecipes versions) or use our own combination of tomatoes and green chilies. 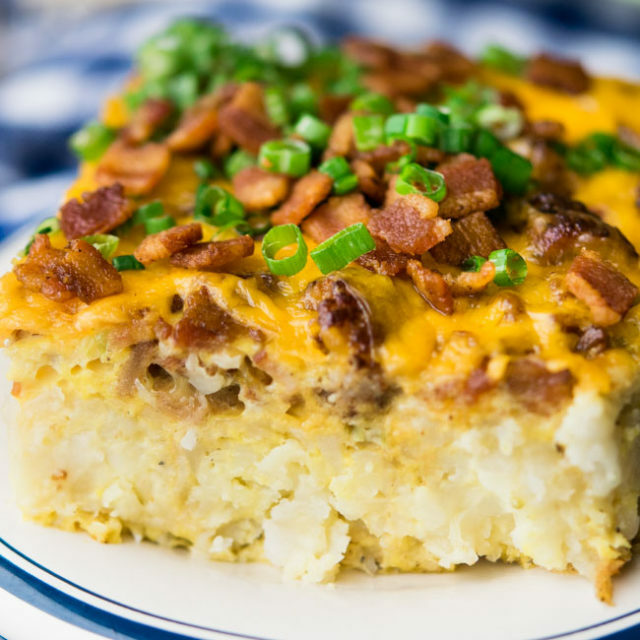 I’ll admit I often prefer the latter (which is why you’ll see it in dishes like my Dorito Casserole), and that’s what I use in this recipe. I find Rotel is a little more watery and less tomato-y, which is fine for my queso, but I want plenty of tomato juice (and flavor) in this chili, so I use my own combo rather than a pre-mixed one. To season, we’ll start with a packet of taco seasoning mix, full of onion, cumin, chili powder (it wouldn’t be taco seasoning without chili powder), garlic and other spices, depending on the brand. Some cooks like to build on the whole seasoning packet thing and make a taco ranch chili, which is basically a taco chili with ranch dressing mix (the taco chili recipe Paula Deen makes uses this). While we all know what a miraculous thing ranch dressing is, and there’s no doubt it adds a flavorful, slightly creamy quality to this dish, I have a different trick up my sleeve that intensifies the “chili” flavors: enchilada sauce. Store-bought enchilada sauce makes short work of homemade enchiladas, but it’s also a great way to add a bit of concentrated “you-must-have-cooked-this-all-day” flavor to other dishes. It boasts a variety of chilies – red, pasilla, guajillo, or hatch – which gives it a deep, earthy flavor that’s a little acidic too. 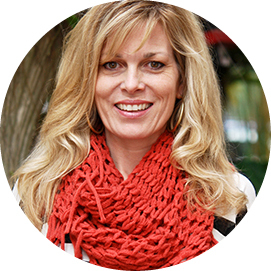 I like to use a mild red variety in this recipe, but you can definitely experiment with a spicy version. Set it and forget! Dinner will cook away on the stovetop while you’re off planning dessert or be prepping a few toppings. Pretty much any taco-style toppings will work on this Taco Chili, things like sliced avocado, chopped cilantro, lime slices, cotija cheese (which is also great in my Mexican Corn Salad), or even a dollop of sour cream. WHAT SIDES DO I SERVE WITH TACO CHILI? Taco Chili kinda begs for crispy tortilla chips, but you can also serve it with a warm quesadilla (or, as I like to call it, Mexican grilled cheese) or a slice of jalapeno cornbread. Fritos work well too, or you can make your own flavored tortilla strips! Just slice flour tortillas into ½-inch slices and toss them in a little olive oil, then season with salt and pepper, a sprinkling of chili powder, or even a little extra taco seasoning mix. Spread into a single layer on a cookie sheet and bake at 375 degrees for 10 – 15 minutes, tossing about half-way through, until they’re crispy. Just don’t eat them all before dinner time! 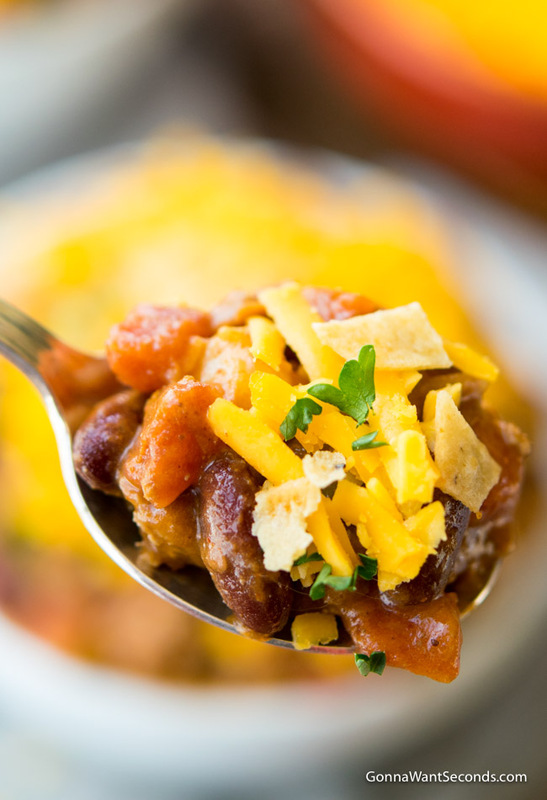 CAN YOU FREEZE TACO CHILI? Taco Chili freezes really well, and it’ll keep in the freezer for at least 4 – 6 months. For best results, make sure the chili cools completely first and use a properly sealed container. Because it does freeze so well, you can also double this recipe and pack your freezer for an extra-fast dinner later. 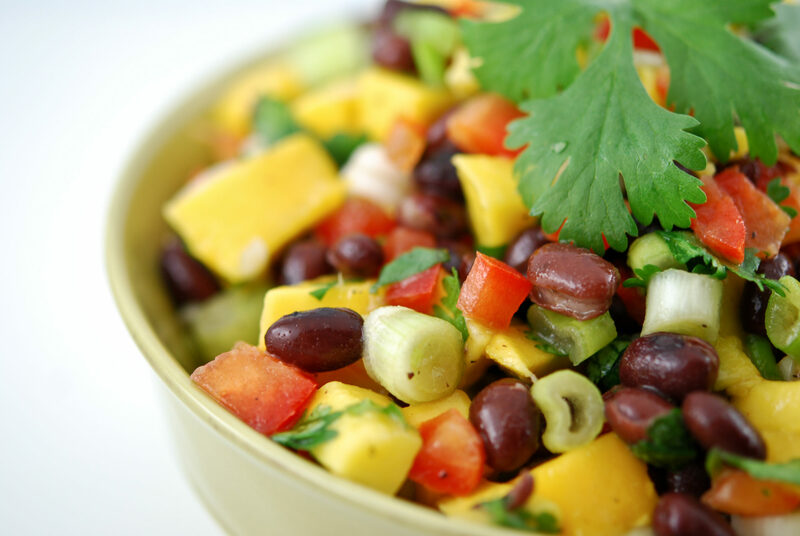 The next time you’re craving fast-food taco take out – like some Del Taco chili cheese fries or a Taco Bell chili cheese burrito, just put on a pot of this Taco Chili instead. It’ll hit all the right taste buds for your Mexican food kick without a trip through the drive-thru! 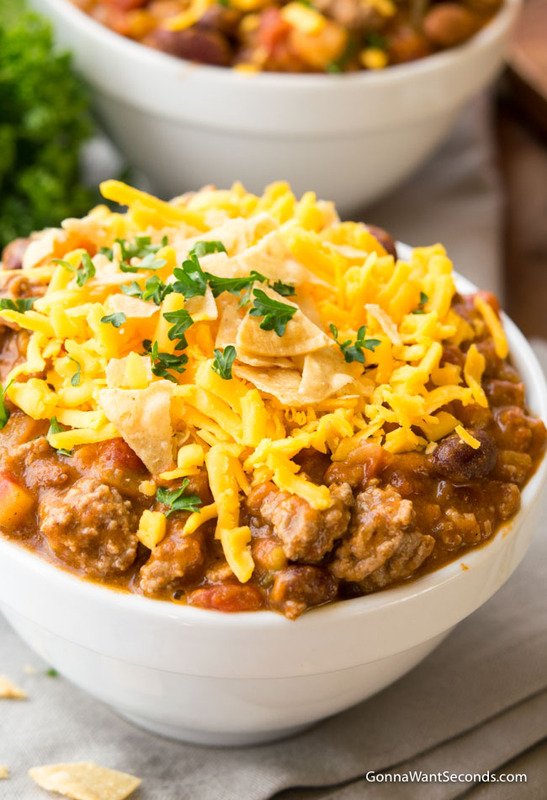 Other cooking options – This is the perfect dish to use a slow cooker for (which is the method Weight Watchers taco chili uses). 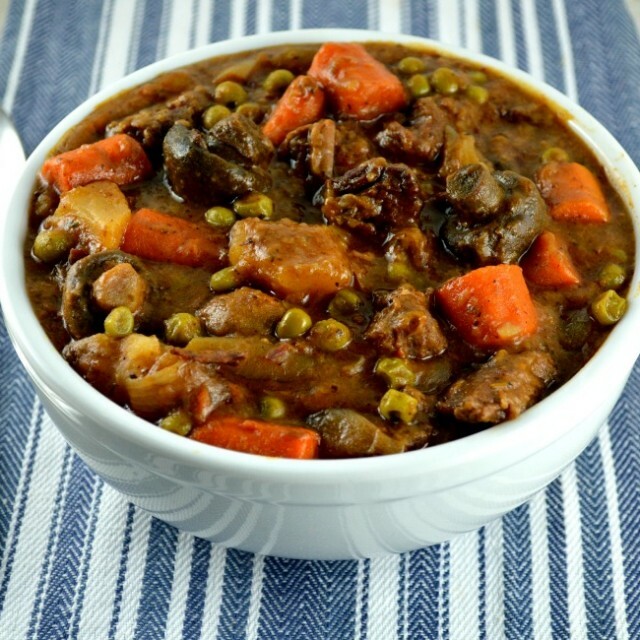 You’ll just need to brown your ground beef and onion, then put everything into your crockpot and cook on low for 6 – 8 hours or on high for 3 – 4. You can also cook it in an Instant Pot using the saute setting to cook your beef and onion, then add the rest of the ingredients and use the “soup” setting for 10 minutes. You’ll want to let it naturally release the steam for 5 minutes, then finish releasing the pressure yourself and serve. 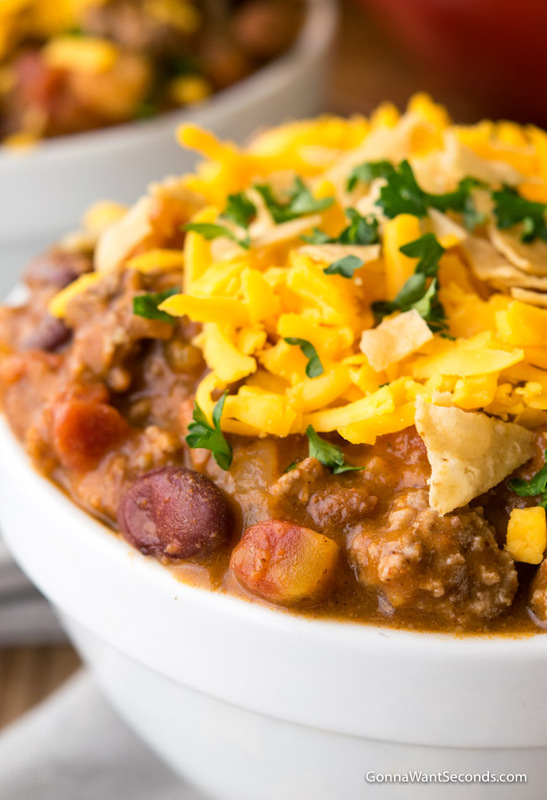 Where’s the beef – if you’d prefer to use something other than beef, you can substitute ground turkey or turn it into a taco chicken chili recipe using leftover chunks of chicken. If you’re going to use the slow-cooker method, you can also just add two pounds of raw boneless breasts or thighs with the other ingredients and let the chicken cook (and shred!) in the crockpot. To make a lower fat version, you can skip the meat altogether and add cooked red lentils, squash, or other veggies to make a vegetarian version. 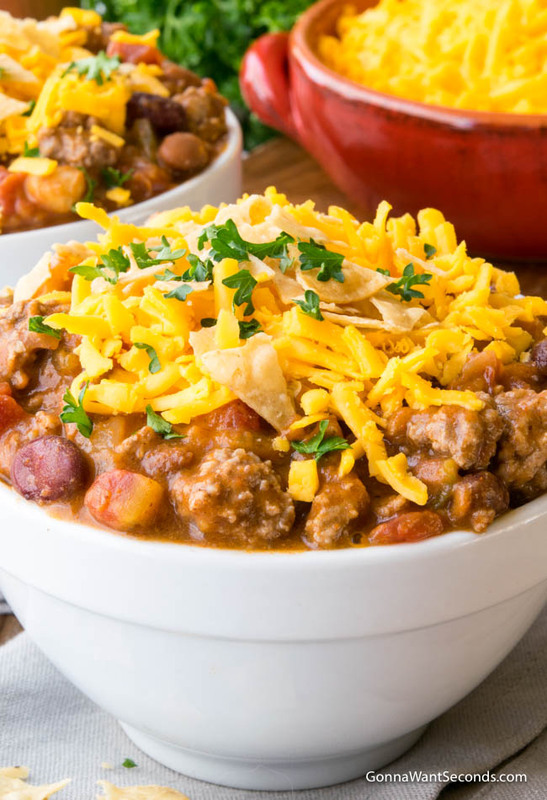 Taco Chili- it’s the chili that the whole family will love! The warm and chunky chili, like your favorite taco filling, is a one-pot wonder dinner favorite. In a large, high sided skillet, saute the ground beef and onion until there is no longer any pink in the beef. Drain. Sprinkle the beef with salt, pepper and taco seasoning. Add green chilies, hominy, chili beans, kidney beans, diced tomatoes, and enchilada sauce. Stir to combine. Bring mixture to a boil over high heat. Reduce heat and simmer on low, 1 hour partially covered, stirring occasionally to prevent sticking. Mexican Meatballs – is the perfect appetizer for any get together. 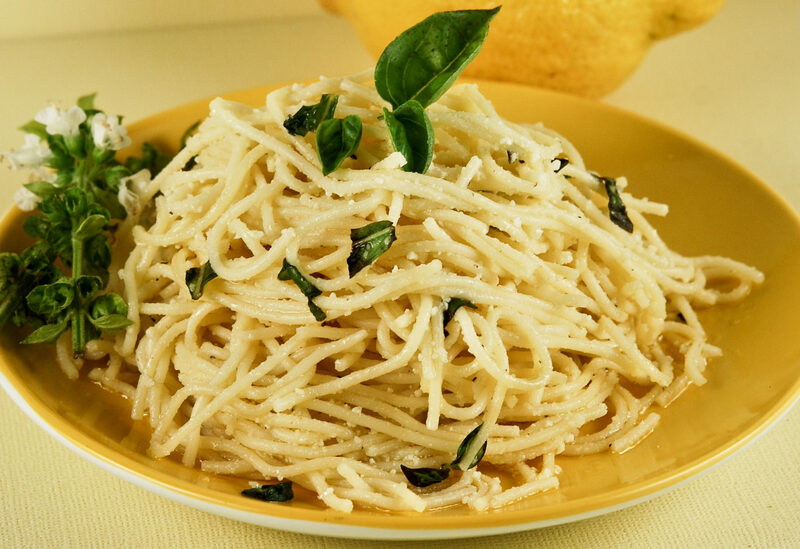 Super delicious, and simple… they’re certain to be a hit! Taco Meat Recipe– With just the right amount of spice, my Taco Meat Recipe is ready in 20 minutes! No need to wait for Taco Tuesday! With this recipe, anytime is Taco Time! Taco Soup– Full of beefy taco flavor, Taco Soup is bursting with meat and beans in a seasoned broth. Pile on your favorite toppings for taco perfection in every bite! Can you tell me what is the serving size, 1/2 cup or a cup? 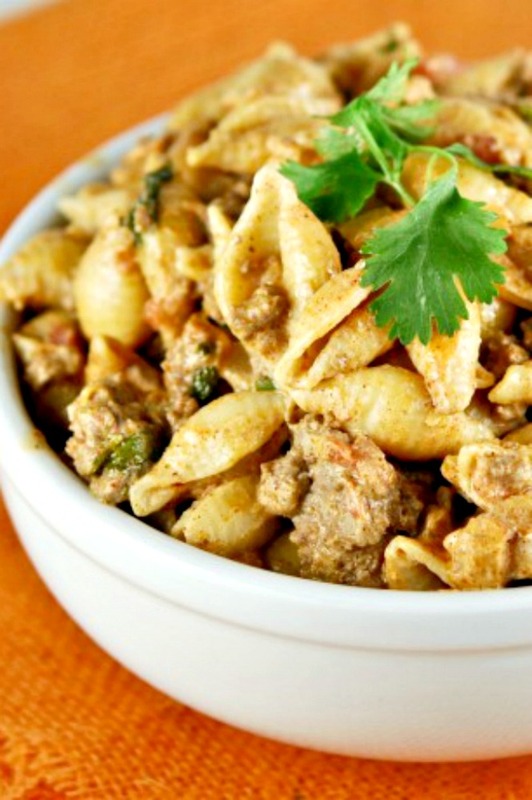 I totally love this recipe!